Claritin-D Review. Does it Work for Colds and Not Just Allergies? 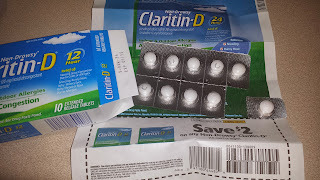 I just started a new campaign to try out Claritin-D courtesy of BzzAgent. BzzAgent gave me a complimentary $12 coupon to use at my local store pharmacy to get the Claritin-D. This medicine came right on time since a few days ago I caught a cold from my coworker. A nasty virus is going around my job and I've became the unlucky one to catch it. I've been coughing, sneezing, blowing my congested nose! I feel miserable! Yesterday I went to Publix to pick up my Claritin-D at their pharmacy. I was very curious to know why these pills would be behind their counter instead of on the shelves so I asked the pharmacist. She let me know that the ingredients in the pills are used by people who make methamphetamine so they have to check peoples' ids and write their names down when they purchase the pills. I was pretty shock to hear this and I even more shocked to know how expensive these pills are! A case of 10 pills is almost $14! Thank goodness for my $12 coupon because I would be very upset to buy these and they didn't even work. Stated on the Claritin-D box it works for allergies and colds. Works up to 12 hours to clear up your nasal congestion and give you sinus relief. I decided to use 1 before bed to see if it'll help me breathe while I'm sleeping so I could get a good night rest. They're non drowsy but I had no problems sleeping over night by taking one of their pills. This morning I felt much better and not all congested but I still had my cough though. When I got to work I started feeling congested again and took another pill and felt better within 1 hour. Is Claritin-D Worth a Try? I like Claritin brand products in general and this medicine didn't disappoint me. Only thing I don't like is the price, so I guess like the saying goes "you get what you pay for"; if I want results I need to pay a little more.